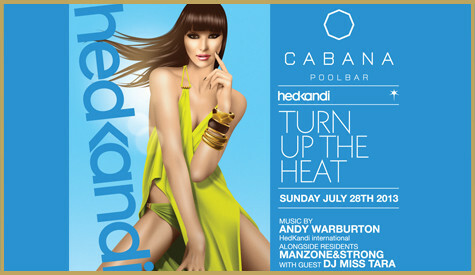 Hedkandi at Cabana with guest DJ MissTara alongside residents Manzone&Strong and Andy Warburton Hedkandi international. Having played across a wide variety of venues across the globe, Miss Tara has been lucky enough to play in some of the most prominent and attractive venues in the finest cities the planet has to offer. Having been involved in filled out venues for several years, her travels have taken her everywhere from the excellent Zelos in Monaco, Nikki Beach in Miami to the Pool Party at Cabana Toronto. This massive venue is a huge part of the Toronto scene and can be the perfect place to come and visit if you want to see things here as they truly can be! Having previously been a guest performer at the excellent sold-out Cabana Toronto, Miss Tara has gathered a massive following over her relatively short career so far, infusing a rich passion for music and positive energy with a crowd-pleasing style, her excellent performance levels have been seen across many different venues. The fan base is growing all the time as Miss Tara finds herself touring various venues working with Hedkanki International, giving her loyal fans something truly different every time in venues such as the brilliant Cabana. This is a big hotspot for those who want to have a great time in Toronto, and has previously been an excellent place to come and see Miss Tara at her very best. The ability to see such high-end performance at a venue as exciting as this can be the perfect place to get started if you are new to Miss Tara; you can join her thousands of fans across the globe as she climbs the rankings of the best DJ/Producers out there at the moment. Cabana is one of the most well respected poor bar locations in a truly awesome city, giving you the chance to enjoy a bouncing atmosphere filled with people from all walks of life and backgrounds. It’s the perfect place to go and have some fun, see some truly different things from wedding engagements to wild parties, helping you enjoy one of the most high-octane lifestyles and atmospheres that you can. With talent like Miss Tara frequenting the venue, it’s no wonder that people wish to come here to so often! This is a best that Toronto has to offer in terms of class and style, so if you wish to see this amazing city at it’s very best – with vibrant, happy people all enjoying their night for as long as possible, make your way to Cabana and catch acts like Miss Tara all the time!